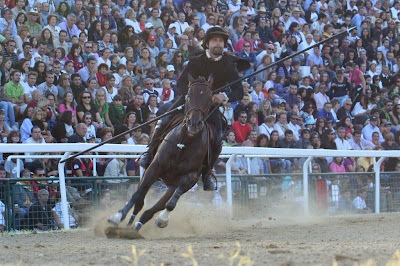 In many cities of Umbria, during the medieval and early modern period, it was customary during certain times of year or solemn festivities to engage in horse shows and popular games, some of which arrived to this day. Others have fallen into almost complete oblivion. It was customary to run the palio setting up a horse race, with or without a rider, whose prize was the "pallium", that is a precious cloth of fine fabric, sometimes embroidered with civic insignia or with gold tooling. Palios were well known in Citta di Castello, Norcia, Gubbio, Perugia, Terni and Orvieto. 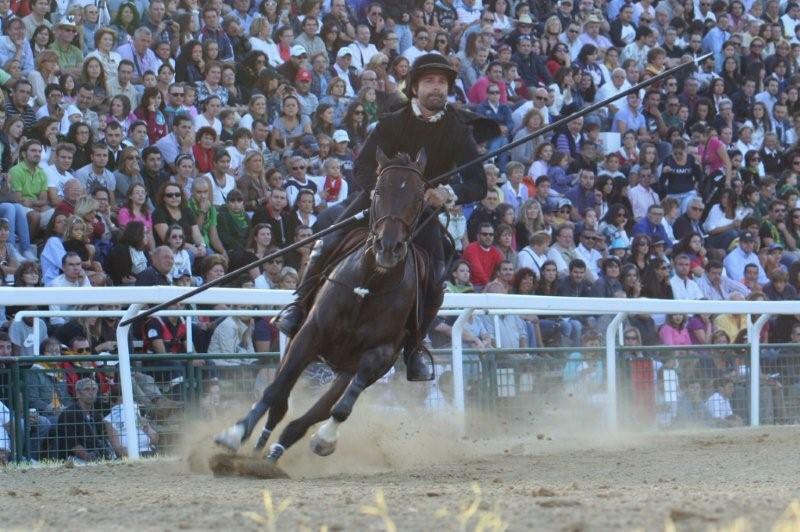 This game, the most ancient and simple, over the years was surpassed and almost definitely replaced between the Sixteenth and Seventeenth centuries by the Quintana joust. It consisted of individual riders usually involved hitting a target with a spear. The target was represented by a sign with colored bands, a slip-ring, or a puppet with Moorish appearance, the well-known Saracen, so fashionable especially after the battle of Lepanto. When the image of Quintana consisted of a human figure, usually a bust, one point was worth a blow to the beard, two points the face and the maximum score was achieved by centering the middle of the forehead. Obviously, with the changing of customs and rules and the larger influence of young aristocrats who could keep more horses and luxurious trappings, the types of prizes to winners also changed. From the prices of the beginnings consisting of civic symbols, baskets of bread, roast meat or hunting falcons, in the Seventeenth century the noble knights engaged in a real tournament were awarded gold jewelry, silk stockings and jeweled crowns. Much less familiar, if not entirely disappeared, is the memory of two other ancient games, also very popular in the Thirteenth and Fifteenth centuries. Such games, if one can call them that, were in fact real battles which saw bulls and dogs deployed in the field and teams of boys armed with stones. Both were common in Perugia since 1260 to honor, along with the Palio, the feast of All Saints or the patron saint of Herculaneum, which is November 1st and March. The so-called "chasing the bull" was a sort of bull-fighting. The fight was set on dirt with a fence of poles and woven hemp rope, in which a large Chianina bull coming from Chiusi was introduced. Unlike the modern Spanish bullfight, it was not a man who fought against the beast, but a pack of trained dogs, which had the task of attacking and biting the bull. At the end of the conflict, the carcass was cut and the meat distributed among the spectators. It's pretty obvious that with the passing of time, this practice became less and less tolerable, and such a sight in the mid-Fifteenth century, especially with Bernardiniana sermons, began to fade and hunting being prohibited. But Perugia, as mentioned above, was famous for another game, also known as the "game of Perugia" perhaps for the fame it enjoyed, also called stone-throwing.